Sphinx, a mythical creature, part human and part animal, common in the art and mythology of several early civilizations. The most famous early representation is the Sphinx (sometimes called the Great Sphinx) at Giza, Egypt. Most scholars believe the monument was built during the fourth dynasty by Pharaoh Khafre in the 26th century B.C. A few scholars believe it is thousands of years older. The Sphinx is a statue with the body of a lion and head of human. The great sphinx of Egypt was carved from a limestone on the Pyramids plateau in Giza. It was not carved in the usual sense of the word, rather giant blocks of soft limestone were quarried around the Great Sphinx to give its basic shape. It looms 241 feet long and 65 feet high. The Sphinx is part of Giza's pyramid complex, where Egypt's largest pyramids are found. The Sphinx has a man's head and the body of a crouching lion. The head is thought to be a portrait of Khafre. The head and body of the Sphinx are carved out of a limestone formation; the paws are made of blocks of stone. The body is about 240 feet (73 m) long and 66 feet (20 m) high and the face is about 13 1/2 feet (4 m) wide. The traditional and majority view is that the Great Sphinx was built at the same time as the nearby Pyramid of Khafre (Chephren) in about 2540 B.C.E. The face of the Great Sphinx has been thought to be Khafre's, though recent evidence casts doubt on this notion. There has been lively debate in recent years arguing that it may be anywhere from two to four times that old. Weathering patterns on the Sphinx that were consistent with water erosion rather than erosion produced by wind and sand. These patterns were not found on other structures on the plateau. Egypt is arid today, but about 10,000 years ago the land was wet and rainy. West and Schock conclude the Sphinx must be on the order of 7,000 to 10,000 years old in order to have the marks of water erosion they found. A theory was developed that the Sphinx, when considered with the neighboring pyramids and ancient writings, is part of, and possibly the first element of, a kind of astronomical map related to the constellation Orion. They have concluded that the "best fit" for this map is found for the position of the stars as they were in 10,500 B.C.E. Finally, there are no inscriptions or writings that directly indicate the builder or date of construction for the Sphinx. There are, in fact, some minor references that the Sphinx existed prior to the pyramids. The Sphinx has suffered the ravages of time, man and modern pollution. The rearing cobra headpiece (uraeus) that sat on the king's forehead is lost, the nose is damaged, and the beard now consists of only museum fragments. The Great Sphinx has fallen to disrepair and been mostly covered by sand many times. A massive and expensive restoration and preservation project has been underway from 1950 to the present. Originally the Sphinx probably represented the power of the Egyptian ruler and of Egypt. Later, however, it became the center of a religious cult and many monuments and shrines were built in the area around it. The shifting sands of the desert have partially buried the Sphinx several times. The most famous legendary sphinx is the Greek monster that terrorized Thebes. It had the body of a lion, wings of an eagle, tail of a serpent, and head and bust of a woman. The sphinx guarded the gates of Thebes, asking this riddle of every passerby: “What creature with one voice walks on four legs in the morning, on two at noon, and on three in the evening?” The sphinx killed everyone who could not answer the riddle. When Oedipus came to Thebes, he correctly answered: “Man, who crawls on all fours as a baby, walks upright in his prime, and uses a cane in his old age.” Whereupon the sphinx killed itself and Thebes was freed. The Great Sphinx is to the northeast of Khafre's (Chephren) Valley Temple. Where it sits was once a quarry. We believe that Khafre's workers shaped the stone into the lion and gave it their king's face over 4,500 years ago. Khafre's name was also mentioned on the Dream Stele, which sits between the paws of the great beast. However, no one is completely certain that it is in fact the face of Khafre, though indeed that is the preponderance of thought. Recently, however, it has been argued that Khufu, builder of the Great Pyramid, may have also had the Great Sphinx built. The Great Sphinx is believed to be the most immense stone sculpture in the round ever made by man. However, it must be noted that the Sphinx is not an isolated monument and that it must be examined in the context of its surroundings. Specifically, like many of Egypt's monuments, it is a complex which consists not only of the great statue itself, but also of its old temple, a New Kingdom temple and some other small structures. It is also closely related toKhafre's Valley Temple, which itself had four colossal sphinx statues each more than 26 feet long. The Great Sphinx has the body of a lion and the face of a man (king?). The age of the sphinx is not known, with guesses varying between six-thousand and even thirteen-thousand years old. The commonly-held belief is that is was created during the 2700s BC, and many believe to have been created at the will of King Khafra, whose pyramid the sphinx happens to be situated in front of, though more recently it has been suggested that the construction was set by Khafra's half brother, Djedefre, in the image and honor of their father, Khufu. The monument was given the name 'sphinx' due to its likeness to a Greek legend of a creature with the head of a woman, the body of a lion, and the wings of a bird. The name used by ancient Egyptians is still unconfirmed, though texts from medieval times suggest names such as "balhib" or "bilhaw". The material of the Sphinx is the limestone bedrock of what geologists call the Muqqatam Formation, which originated fifty million years ago from sediments deposited at the bottom of sea waters that engulfed northeast Africa during the Middle Eocene period. An embankment formed along what is now the north-northwest side of the plateau. Nummulites, which are small, disk-shaped fossils named after the Latin word for 'coin', pack the embankment. These were once the shells of now extinct planktonic organisms. There was a shoal and coral reef that grew over the southern slope of the embankment. Carbonate mud deposited in the lagoon petrified into the layers from which the ancient builders, some fifty million years later, carved out the Great Sphinx. To do so, they trenched out a deep, U-shaped ditch that isolated a huge rectangular bedrock block for carving the Sphinx. This enclosure is deepest immediately around the body, with a shelf at the rear of the monument where it was left unfinished and a shallower extension to the north where important archaeological finds have been made. 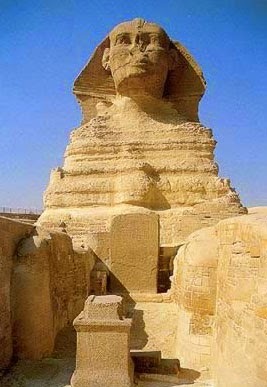 The good, hard limestone that lay around the Sphinx's head was probably all quarried for blocks to build the pyramids. The limestone removed to shape the body of the beast was evidently employed to build the two temples to the east of the Sphinx, on a terrace lower than the floor of the Sphinx enclosure, one almost directly in front of the paws, the other to the south of the first one. The Great Sphinx can be found near the banks of the Nile , facing east, away from the pyramid of Khafra (near modern day Cairo). As the years passed after its construction, the areas around the sphinx were left to the elements, covering much of it in sand. A piece of stone covered in writing called the Dream Stela tells of a young prince who fell asleep against the parts untouched by the sand drifts and dreamed the sphinx talked to him, promising him kingship over Egypt if he could clear all of the sand. He was later known as Thutmose IV. It is also believed that Ramesses II removed the sand later, and the last large clearance took place around 1925. Over the many years, the Egyptian sphinx has not remained in pristine condition. As seen in photographs, the defacement of the sphinx goes beyond simple erosion by the elements. The story goes that the loss of the sphinx's nose is due to Napoleon's army using the monument as target practice. There are drawings and etchings, though, that show the sphinx had been noseless for easily a hundred years before Napoleon even arrived. There were three tunnels built in the Sphinx, but the passage of time has left the destinations unreachable and the tunnels themselves seem to basically stop short. Because of the limited resources and writing found on and around the sphinx, very little else is known about the structure (hence the "Riddle of the Sphinx"). All that we can be sure of is its immensity and the level of craftsmanship required to build it. Two authors, Graham Hancock and Robert Bauval, connect the sphinx to astrology. They claim that the lion shape is a reference to the constellation of Leo, the pyramids at Giza a reference to Orion and the Nile a reference to the Milky Way. In general these claims are regarded as pseudo science and have been refuted. It is generally thought that quarrying around the original knoll revealed rock that was too poor in quality for construction. Therefore, some visionary individual conceived of the plan to turn what was left of the knoll into the Sphinx. However, the Sphinx may equally well have been planned from the start for this location, good rock or bad. The walls of the Sphinx enclosure are of the same characteristics as the strata of the Sphinx body and exhibit similar states of erosion. The bedrock body of the Sphinx became a standing section of the deeper limestone layers of the Giza Plateau. The lowest stratum of the Sphinx is the hard, brittle rock of the ancient reef, referred to as Member I. All of the geological layers slope about three degrees from northwest to southeast, so they are higher at the rump of the Sphinx and lower at the front paws. Hence, the surface of this area has not appreciably weathered compared to the layers above it. Most of the Sphnix's lion body and the south wall and the upper part of the ditch were carved into the Member II, which consists of seven layers that are soft near the bottom, but become progressively harder near the top. However, the rock actually alternates between hard and soft. The head and neck of the Great Sphinx are made of Member III, which is better stone, though it becomes harder further up.